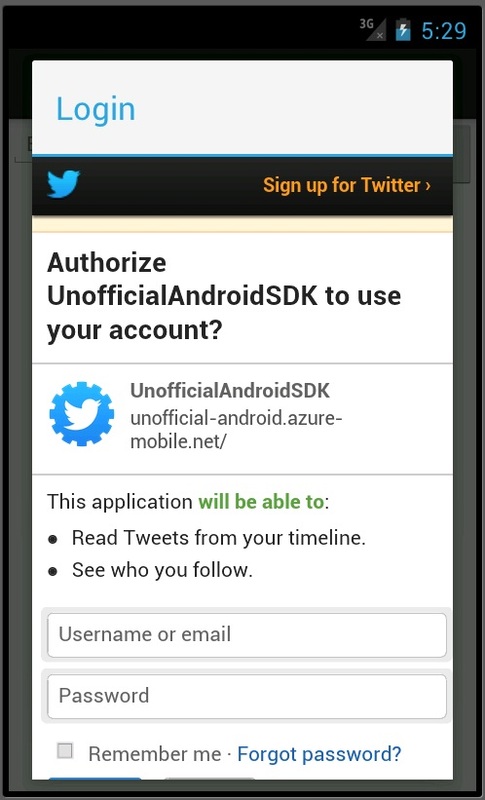 As of writing, we’re still working on the official Android SDK for Windows Azure Mobile Services. However, as I pointed out during a presentation at CodeMash earlier this year, one of the Microsoft MVPs, Sasha Goldshtein, created an unofficial Android SDK. This SDK, which is available on GitHub, includes some sample documentation to get you started with data storage, authentication, as well as push notifications. In fact, just about everything you can do with the official iOS, Windows Store, and Windows Phone SDKs can be done with Sasha’s SDK. He really has done a great job of putting together something that can be used right now. Today I’m going to take you through taking an existing project and adding support for data storage, authentication, and push notifications into it. If you want to go straight into the finished code, you can download the GitHub repo here. Once you have it, take a look at the source/end directory for the completed code. Just make sure you set the proper settings (URL, Application Key, push token, etc) to match your Mobile Service and Google API info before running. The first step today will be to pull down Sasha’s SDK from GitHub. I recommend doing this by cloning the URL for his repo. Once you’ve pulled down the repo, go into Eclipse and go to File and then Import. In the window that comes up next, choose Existing Projects into Workspace and hit Next. Browse to the directory containing the SDK and click Finish. 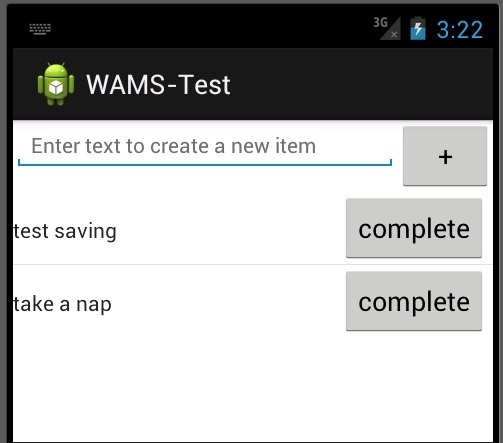 You should now see WAMS-Android as a project in Eclipse. If you expand the project and it’s src folder, you should see Sasha’s namespace net.sashag.wams.android. Now you’re ready to start with the app. There is also a complete button next to each item but that currently doesn’t do anything. If you shut down and rerun the application, you’ll notice that your todo list is blank again. This is because we’re not currently persisting this data anywhere. Handling that will be the first step in using Mobile Services. 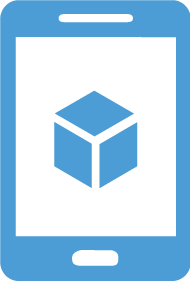 If you haven’t already done so, make sure you spin up a new Mobile Service in the Windows Azure portal. I’m not going to talk a lot about doing this in this post because I already have. If you need assistance with creating a new Mobile Service, or where to get the Application Key or create the Todo Item table we’ll need later on, check out this post from a few months ago. You can ignore all of the code parts of that post and just focus on the process to create a new Mobile Service, get the key, and create the table. When you’ve done with that, proceed on. Now that that’s done, we can move on to working with data. The first annotation is the DataTable one. This tells the SDK what table this class matches up with in Mobile Services. We then have two DataMembers. This is how we tell it what the field names should be when they are sent to, and received from, our Mobile Service. Lastly, we have Key which is needed for all classes that are tied to a table in Mobile Services. Now we can work on loading the items back in on launch. This method calls the todoTable’s where method and says that we want to select all of the items where the complete field is false and says we want to do it asynchronously. We are passing into that a MobileServiceCallbackWithResults that also has an error and success method. In the success method, we are setting our internal array (todoItems), creating a new TodoArrayAdapter, and then setting that as the adapter for our ListView. The last thing you’ll need to do is add a call to this method into your onCreate method. 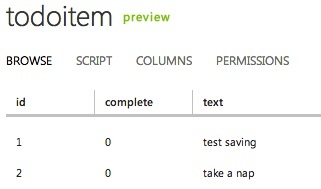 Now when you run your app, after a second or two you should see the todo items you added before reappear. This method will loop through the todo array and find the correct item by it’s text. It will then call the todoTable’s updateAsync method. When that call returns successfully, we remove the item from the array and then notify the adapter that the data set has changed. Now, open up the TodoArrayAdapter and add a call to todoList.markItemComplete(text1.getText()); to the OnClickListener near the bottom. Now when you run your app and tap the complete button, it should update the record on the server and remove it locally. Now let’s go back to the Windows Azure Portal and make the necessary changes there. Here we can see that the push notification that came back had the text I put in, test push, along with the from push text we added in the insert script. After logging in, you should see the todo items load up. Save that and rerun your app. Now you should only see the single todo item that was saved with my Twitter ID. If I were to run the app under a different user, I wouldn’t see any todo items. Today we walked through quite a bit and learned how to use Sasha’s unofficial Android SDK for Windows Azure Mobile Services. We went through saving and loading data, handling push notifications, and authenticating. Thanks to Sasha’s herculean efforts, you have access to everything that the unofficial SDKs can do with Mobile Services. In time, an official SDK will be released and I’ll update this article to point you in that direction. For now though, you can use this SDK and rest assured that things won’t change on the server side even if you have to modify a few things for the official SDK (plus the calls to GCM will be made easier). You can access the completed application source code at this GitHub repository. The finished app is under source/end and the server side scripts we used are available under source/scripts. You’ll need to set the API settings in the strings.xml file in addition to setting up your Mobile Service for Twitter auth. Lastly, make sure you put your own Google API key in the push script.